Beneath a Steel Sky is a classic adventure game by Revolution Software, the same brilliant guys that gave us also Lure of the Temptress and the Broken Sword series. Long ago they made this adventure freeware and, after some testing, I decided to include it in VmwAROS too. 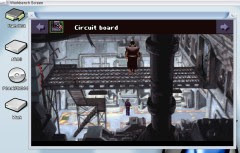 The game behaves quite well on VmwAROS: I noticed that AROS ScummVM tries to create a directory for savegames using the 'mkdir' command, however this task should be performed by the 'makedir' one. So I created an alias in S:user-startup and now it should work as expected (I don't know exactly if it actually auto-saves, however saving position in-game works). Sound is turned off, but this shouldn't be a surprise on VMware. For your comforts, a Steel_Sky launch script with icon has been created as well.